Dogra Art Museum, Jammu previously known as Dogra Art Gallery with a special collection of Basohli paintings was inaugurated by Dr. Rajender Prasad, His Excellency the President of India on 18th of April, 1954. at Gandhi Bhawan, Jammu. This gallery was upgraded to a full-fledged multipurpose museum and shifted in 1991 to its present building situated in Mubarak Mandi complex, Old Secretariat, Jammu known as Pink Hall. 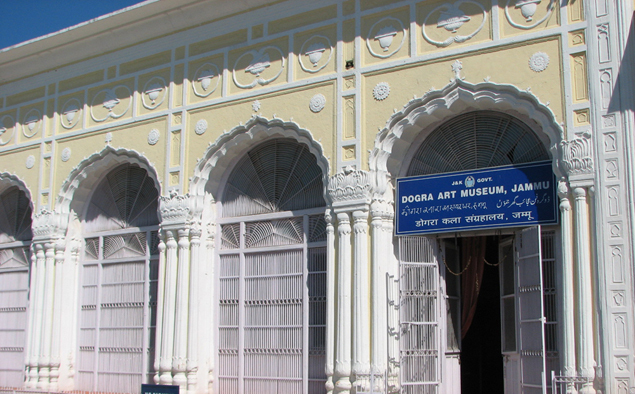 Dogra Art Museum, Jammu the abode of treasure trove of Dogra Cultural heritage. The museum is known world over for its collection of miniature paintings especially paintings from Basohali. The other collections of this museum are Terracotta heads from Akhnoor. Sculptures, numismatics, manuscripts, dogra costumes, jewellery, arms and armoury, metal objects and decorative art. The intricately decorated marble jharokhas with inlay work of semi precious stones in the marble hall further embellishes the charisma of the museum collection.